"We're Eloquent Light. We're passionate about photography and photography workshops . . .” Over 30 Years of Exceptional Photography Workshops. Since 1986 Eloquent Light has offered exceptional hands-on photography field workshops and tours. We are out photographing every day to capture the light, color, beauty and character that is our world. 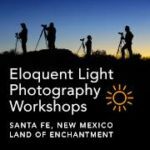 Our workshops are for the novice to the experienced photographer—for anyone who is passionate about making great photographs while exploring the beauty of New Mexico, the American West and beyond. . .